The 2,424 acre lake divided into east and west pools with a connecting channel. The Lake located in Lake County and Orange County, just south of SR 50. 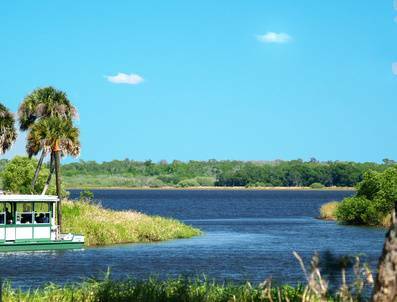 Lake John is beautiful and residents of the area refer to this lake as the “John’s Chain” as the lake’s shoreline is varied enough to create the impression of multiple lakes. The south and eastern shoreline of Johns Lake almost totally undeveloped and helps to create a very peaceful lakefront setting. Johns Lake is famous for bass fishing, but is also home to a generous amount of shellcracker, bluegill and speckled perch. Shaped by irregular bottom contours The lake experiences moderate water fluctuations. Even under our recent drought conditions the lake levels have held up nicely. Shallow water offshore occasionally forms islands from emerging vegetation growth, but this is rare. These islands make great fishing spots replete with bass and schools of bluegill and shellcracker. 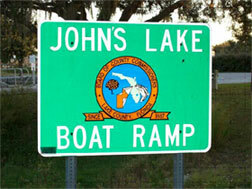 The Florida Fish and Game Commission maintain a boat ramp. Traveling westbound on SR 50, make a left on Lake Blvd and the ramp is on the right. The ramp has a floating courtesy dock where bank fishing is also allowed. A paved parking lot capable of accommodating 20 vehicles is available.